Hindu Mythology has lots of legends hidden in its scriptures but what is more interesting about those is that they are relatable with the realty of things. Uttarakhand is regarded as the Dev Bhoomi or the land of the gods’ because the Himalayan Mountain Range here hosts the maximum number of temples from the Hindu Legends. 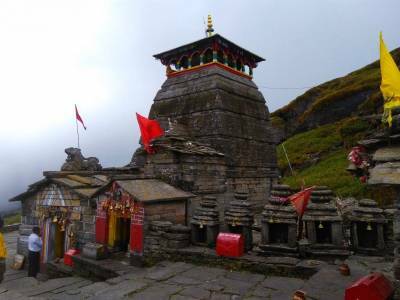 The Tungnath Temple is one of the legendary temples of Lord Shiva, the destroyer god. The temple of Tungnath is deep seated in a high precipice of the Garhwali Himalayas. It is one of the cornerstones of the divine Saivite pilgrimage circuit of Panch Kedar. 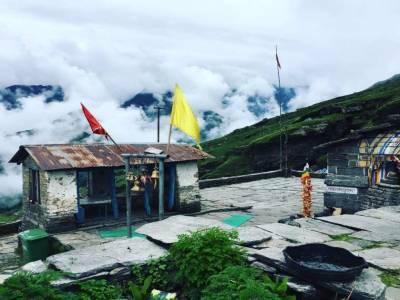 According to the legends, the Tungnath Temple is the place where the Pandavas witnessed the limbs of the bull that was the disguised form of Lord Shiva. This led to their eventual attainment of salvation. The Tungnath Temple is believed to be the highest Saivite temple in India and one of the highest ones in the world. The historical evidences state that the temple was built by Shankaracharya. Located in the Rudraprayag district of Uttarkhand, Tungnath Temple is a divine place between the valleys of Alakananda & Mandakini. For devotees this is a pilgrimage site and for travelers an enigmatic snowy mountain cradle. 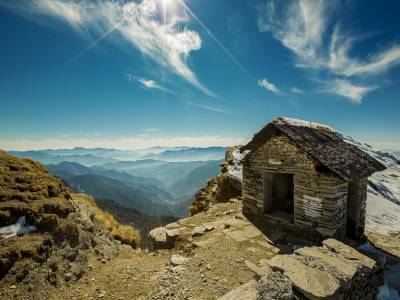 Other than being a religious destination, Tungnath is also famous for a trekking destination. One of the most beautiful treks in the Garhwal Himalayan region. The Chandrashila summit trek is one of the moderate treks in the Indian Himalayan region and can journeyed all throughout the year. Though the trekking route is covered with brawny stones, the marvelous view of the highly embellished meandering pastures makes ones trek an awe inspiring one. As the trek progresses the meadows would make their way to pink, white and mauve Rhododendrons flowers. Tungnath has a cool climate all through the seasons. April to August offers cool and pleasant climate and the right period to spend relaxing moments in the outdoors and is ideal for temple visits. September to November is good for sightseeing and temple visits. December to March is snowcapped valley. Accessibility: The temple can be reached by a 3 km long trek starting from Kanak Chauri which is a 40 km drive from Rudrapayag the closest town and about 69 kms from Rudrapayag city, about 210 kms from Rishikesh, about 232 kms from Hardwar, about 250 kms from Dehradun, about 454 kms from delhi and about 224 kms from the nearest airport. 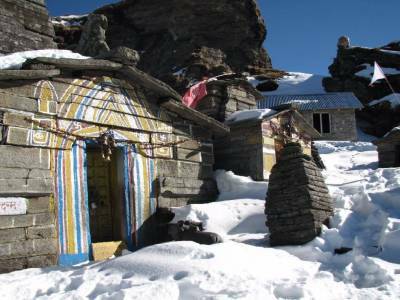 Accommodation: There are couples of places to stay Chopta and Tungnath, you will find very basic accommodation near Tungnath but chopta you found couple of geust houses and private hotels. 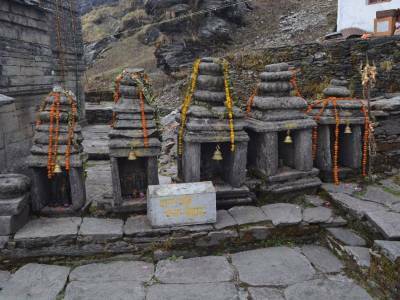 Get quick answers from travelers who visit to Tungnath Temple.